Determination, focus, and ambition; professionally, these traits can be credited to Dr. Paul Zimprich’s success. He is a man who has had a clear vision of what he aspired to achieve in his career and is making it happen. At 35-years-old, he owns his own equine veterinary practice, gives back to the community, and still makes time for a little fun. After earning his Bachelor of Science degree in Microbiology and Biotechnology from North Dakota State University, then achieving his Doctorate of Veterinary Medicine from Iowa State, the young veterinarian interned with Peterson and Smith Equine Hospital. He called his time at the hospital influential and rewarding. Zimprich fondly remembers getting the call from Dr. Donnie Slone that he had been accepted in the program. Dr. Zimprich left Peterson and Smith’s internship program 2005 with the goal in mind of buying into a practice he could make his own. He did just that, moving from his home state of North Dakota, to Andover, New Jersey, and became an associate at Tranquility Large Animal Veterinary Service as an equine practitioner. After a year, Zimprich bought the equine division of Tranquility and renamed it East Coast Equine Veterinary Services, beginning his journey as a business owner. Today, the ECE is a fully operational ambulatory practice serving the northern New Jersey area of Sussex, Warren and Morris counties. Zimprich’s business provides equine medicine, minor surgery, dentistry, reproduction, and sports medicine services. East Coast Equine is dedicated to being current in equine veterinary technology, medicine and procedures. Zimprich hired on two veterinarians, two technicians, and three administrative positions. Because of his positive experience during his internship, Zimprich sent his newly graduated associate, Dr. Alex Ciuffitelli, VMD, to Peterson and Smith’s equine veterinary skills practicum in August 2014. Zimprich follows through with that dedication of continued education by reaching out to the community through ECE. He is committed to supporting the PRCA Pro Rodeo and offers volunteer work to benefit the Sussex County Christian School, is on the fair board, local horse shows and functions of 4H, and has several scholarship programs for high school and college students actively seeking a future in animal science. He also initiated a mentorship program assisting foreign veterinary graduates to successfully complete their practical examinations. 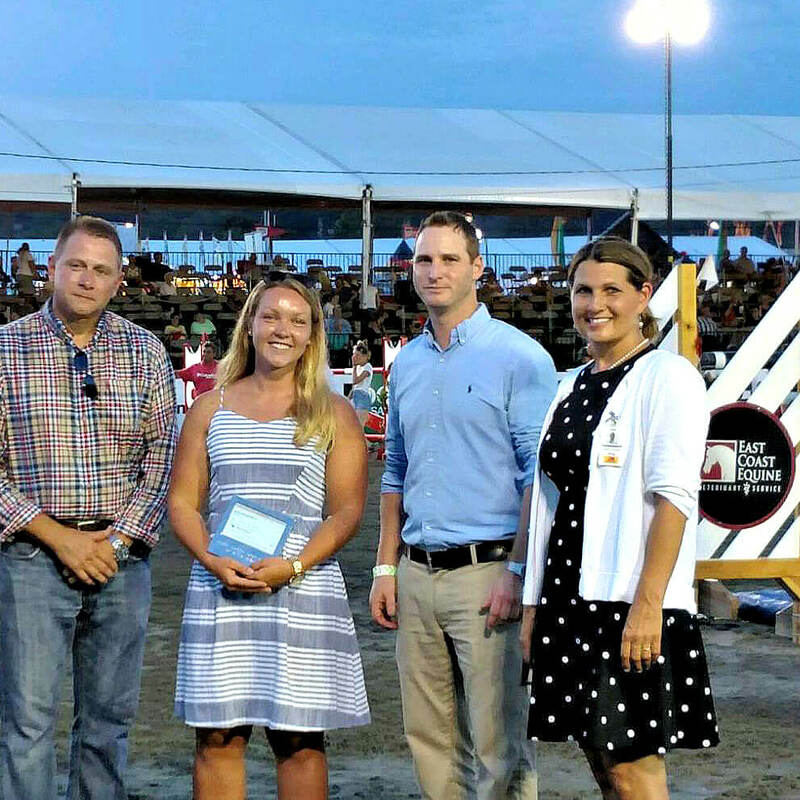 In 2014, he was appointed the veterinarian for the New Jersey State Fair Horse Show and assisted establishing the biosecurity parameters and protocols for the Sussex County Fair Grounds. Because of his hard work professional and communally, Zimprich was recognized as a New Jersey Young Business Leader. Growing up on his parent’s ranch in North Dakota, he had many great mentors and opportunities to excel, he said. Zimprich often worked closely with veterinarians and through 4-H, which is where he developed his sense of community support. “When you get to that point, you should give back when you can,” he said. Now that he has associate veterinarians, Zimprich said he is going to take a backseat to practicing and focus on building the business. Next on his agenda is finding a property with proper zoning to establish a new facility and take ECE’s services to the next level. When he isn’t working, the veterinarian likes to do anything outdoors, from hunting to skydiving to playing polo. He has a Chihuahua named Emma, he affectionately said isn’t a “real dog.” Back home in North Dakota, he has a ranch horse named Cutter, his father still rides. We appreciate the praise and continued acknowledgement Dr. Zimprich has shown Peterson and Smith Equine Hospital, and wish him the greatest success.